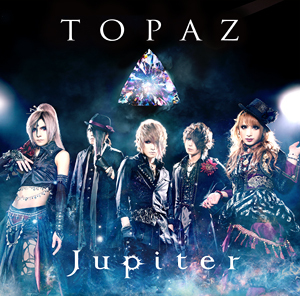 Some days ago visual kei band Jupiter had released their brand new single “TOPAZ”. As I wrote before the single was released in 2 different editions. I was able to get the regular edition, which include 3 songs. As I listened to the main track from the video, which band uploaded, I had big expectations for this single. I had listened to their album “The History of Genesis” and I think that this single is good continuation. As expected, the first song from the single is the title track “TOPAZ”. It begins with nice melody, played at a piano. It’s nice how the other instruments slowly weave into the song. The lyrics are very good and vocalist’s melodic voice makes the song sounds very touching and warming. We also can’t ignore the perfect performance of both guitarists and bassist with this so familiar sound of Versailles. Guitar solo at the end of the song is as always well woven into the song and the melody. It’s just an awesome title song. Great work! The second comes the song “Iolite”. It’s faster than the first song, with very catchy melody, which makes you move your body in sync. I like the heavy sound in Zin’s voice and I’m perfectly sure that I’ll be able to make headbang at this song. Heavier sound of solo guitars is just too awesome and the drum sound makes you want to jump and jump. I also like how the song ends – with a promise for more. I will wait for more songs like this one. The final song from the single is “Rose Quartz”. It’s a voiceless track, but what an amazing track. It starts with some unique sound and cool guitar riffs. It makes me want to play along with the band – just to grab a guitar and go on the scene. Then the melody changes and it’s again that great sound we can remember from Versailles’ songs – I like this. Then the sound goes like in an epic movie story and then again drums are added. The whole song is perfect mixture between different sounds. For instrumentalist like me this song is pure pleasure to listen to. I’m in love. Perfect single as always. Good sound and different songs – it’s absolutely recommended! Give it a try!